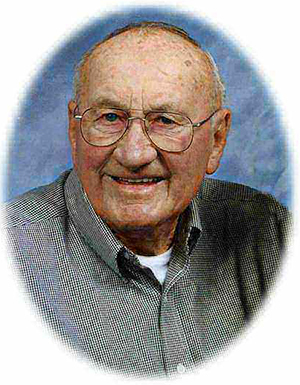 Obituary – Bezdicek, Charles J. « Perry High School Alumni Association, Inc.
Obituary – Bezdicek, Charles J.
J. “Charlie” Bezdicek, 84, of Perry, Oklahoma was the son of Joseph and Mary Holba Bezdicek. He was born on June 12, 1924 on a farm South of Perry, Oklahoma and died Saturday, November 8, 2008 at Perry Memorial Hospital. Charlie was a graduate of Perry High School. He served his country in the Army Air Corp in World War II from September 1942 to May 1946. On December 24, 1946, Charlie married Delores Marie Spillman in New Boston, Texas. She preceded him in death on April 6, 1992. Charlie later married June McGuar on November 8, 1997 in Perry, Oklahoma. Charlie worked as a lineman and was the utilities manager for the City of Perry for over 42 years. He was a member of the First Christian Church, the Antique Tractor Club and the Ellis-Jirous American Legion Post No. 53. Funeral services will be 2:00 p.m. Wednesday, November 12, 2008 at the First Christian Church. Rev. Martin Foster will officiate. Interment will be in Grace Hill Cemetery. Services are under the direction of Brown-Dugger Funeral Home in Perry. Memorials may be made to the First Christian Church or the American Cancer Society in care of Brown-Dugger Funeral Home, 1010 N. 7th Street, Perry, Oklahoma 73077. Charlie is survived by his wife, June Bezdicek; one son, Robert Bezdicek and his wife, Linda, of Tulsa, Oklahoma; one daughter, Tana Fraire of Perry, Oklahoma; two step-sons, Randy McGuar and his wife, Dian, of Perry, Oklahoma and Rick McGuar and his wife, Shirley, of Glencoe, Oklahoma; eleven grandchildren, Christopher Fraire, Gabriel Fraire, Jayson Shields and his wife, Jennifer, Kali Hughey and her husband, Kyle, all of Perry, Oklahoma, Dawn Kukuk and her husband, Gary, of Orlando, Oklahoma, Joseph Bezdicek of Los Angeles, California, Kevin Bezdicek and his wife, Kasi, of Enid, Oklahoma, Rani McGuar of Edmond, Oklahoma, Jaci McQuesten and her husband, Joe, of Chicago, Illinois, Kenzi McGuar of Stillwater, Oklahoma and Trey Breaux of Tulsa, Oklahoma; eight great-grandchildren and one sister, Rose Mary Bezdicek of Perry, Oklahoma. He was preceded in death by his first wife, Delores Bezdicek, two daughters, Kim Jordan and Charlene Shields, one infant son, Johnny Bezdicek, one grandson, Joshua Bezdicek and his parents, Joseph and Mary Bezdicek.